1 Veggolato (sweet vegan chocolate) - 200 g apricot jam - dark chocolate glaze to taste. 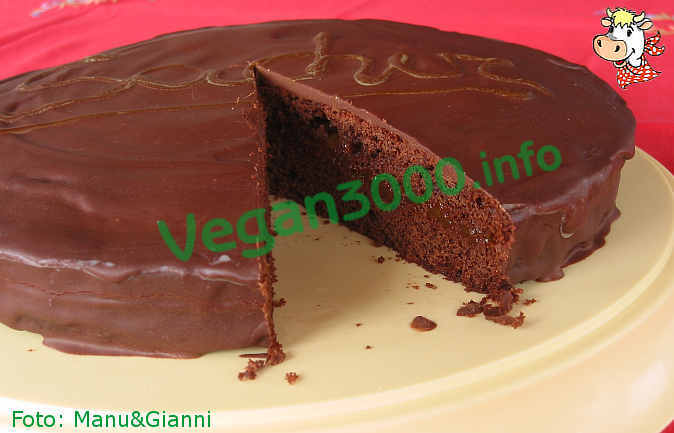 Prepare first the Veggolato (sweet vegan chocolate) (made with only basic ingredients, without adding of optional ones), which is an excellent base for Sachertorte vegan. You only care to prepare it in a circular mold. Once baked and cooled, cut it in half like a sandwich. Then add 200 g apricot jam (half a jar) and close sandwich. Cover with chocolate frosting (you can soften it with oil, margarine or soy milk).